This week the Remington Man and I have been working hard on a few pieces for Jack's little nursery. We are converting it from our study into his little home. I found a long dresser at a consignment shop that fit the dimensions perfectly to double as a changing table. Unfortunately the price wasn't perfect but it fit in the budget so we got it and painted it up. Sadly, the last coat is still drying so I won't be able to put the pics up until Monday. 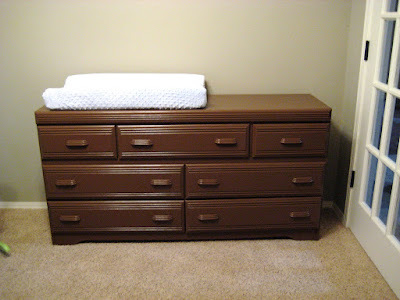 Here it is...I really don't want the dresser to be the focal point of the room so I painted a plain brown. 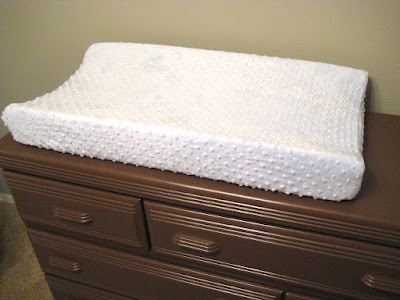 I am so excited the changing pad fits and looks great up there! I can't wait to see what all of you have been up to this week! So what have you MADE?